Last week was Thanksgiving in the US (fourth Thursday after the first Monday), traditionally a day to spend with family. For most of my adult life, I’ve lived in a different city than my immediate family. Thanksgiving was always one of the days I was asked to be home (the other was Passover) since it was a day to celebrate the blood bonds. And I tried, every year when I could, I was back in Vegas. Then four years ago, I moved to Europe. Suddenly, going to Vegas for the night wasn’t as easy as a 300 mile (500km) drive. Last time I went to Vegas it was a 31 hour bit of travel. 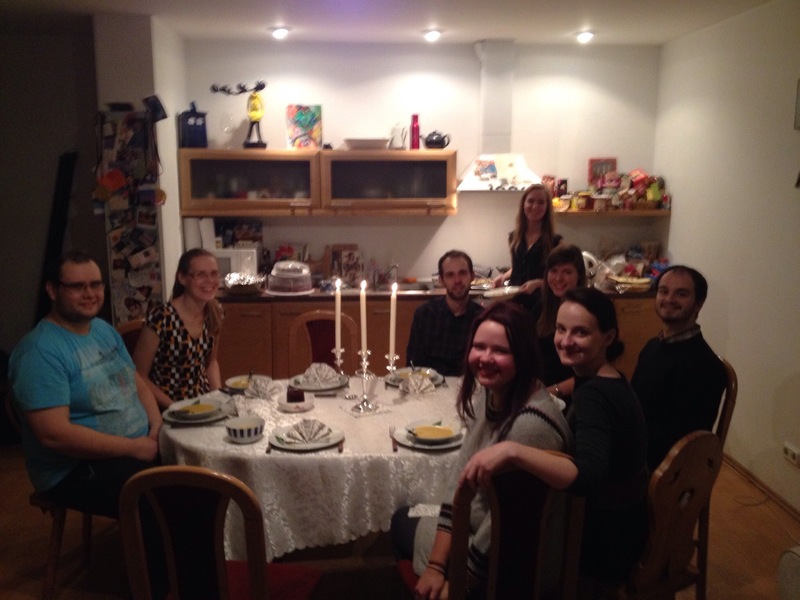 So here I am in Lithuania, spending the last 5 Thanksgivings without my biologicals. But that’s okay, actually. I still Skype and call back to the old homestead and then get to spend the day with new friends and chosen family. In the past I’ve gone to restaurants with co-workers and been invited to the home of a fellow ex-pat for a Turkey dinner, but this year… this year we did the full Monty. My friend (sister) Dove called a few weeks back and “suggested” we do a Thanksgiving dinner. She thought it would be fun to do something American to remind me of home. I asked Rasa if she were up for it and she agreed to take on most of the big cooking chores. We hit up the folks for holiday care package and they delivered in spades. We got packets of Stove-Top and cans of jellied cranberries among other things. Then we got a 4 kilo turkey (almost 9 pounds) and by then the guest list had expanded to 10 people. The night of, Monika (you all know Monika) brought extra chairs from her place (basically next door) and her brother brought along his projector and screen. Dinner was great. The turkey was delicious, the sides were yummy and the company was perfect. After stuffing ourselves (as American tradition dictates – for one of our guests, Tayfun from Turkey, this full feeling was happening for the first time in his 4 months in Lithuania). After dinner, since we didn’t have football to watch or Black Friday to prepare for, we set up the projector and screen and I proudly showed the Rankin/Bass Rudolph, The Red Nosed Reindeer. It was a huge hit, if for cheesy american pop culture nostalgia value if nothing else. And Dove, who set this whole thing up, has offered to host next year’s event! A perfect day.